On Sunday(Yesterday), the Website belong to Egypt's state television was hacked by hackers group called "Eg-TeAm-R1z" protesting what they said was biased coverage of the clashes between security forces and protesters in central Cairo. 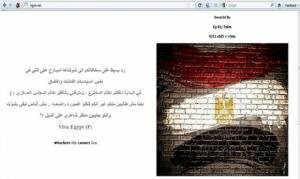 The hackers defaced the website with the Egyptian flag picture painted on to a wall. The flag is captioned using L337 speak, or H4XX0R as it is also often know. 'Previously, you were hypocrites working for the Mubarak regime. Now you're hypocrites working for the military regime. All we ask you is to broadcast a clear image, rather than airing romantic views of the Nile while people are dying,' the message added. Clashes erupted on Saturday between protesters and security forces who tried to prevent demonstrators from making their way to Tahrir Square to express their dissatisfaction with the ruling Supreme Council of the Armed Forces. Activists have accused state television of inciting violence with its coverage, especially since an anchor called on 'the Egyptian people to protect the military against Coptic protesters' during an October 9 rally, in which 27 people were killed in clashes between Christian protesters and government troops.